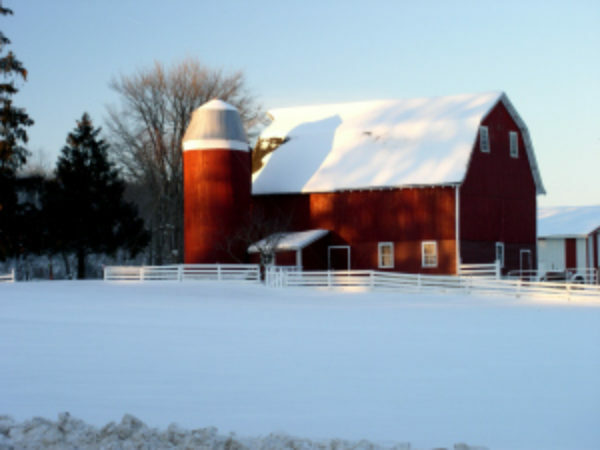 Farm building safety should not be neglected during the winter, especially with the threat of snow loads which can cause the roof on a farm building to collapse. When heavy snow meets fierce winds, even the best-engineered buildings can collapse. That's why it's important to calculate your roof load and be adequately insured for this type of situation. Snow load is the downward force on a building’s roof by the weight of accumulated snow and ice. The roof or the entire structure can fail if the snow load exceeds the weight the building was designed to shoulder, or if the building was poorly designed or constructed. It doesn’t take a blizzard to cause problems. An imbalance of drifting snow can cause one part of a roof to give, causing a domino effect. For example, a roof with 3 feet of light snow has an estimated roof load of 60 pounds per square foot (3 ft depth x 20 lb/ft2 / ft depth density = 60 lb/ft2). You should know the roof weight limits for your barns and outbuildings. If necessary, rebuild or fortify them to withstand worst-case scenario snow loads and meet local building standards. To avoid unbalanced snow load, do not remove all the snow from one side but take snow off from both sides gradually. Keep in mind metal tools conduct electricity if it touches a power line, stay well clear.